This article is one of a 2 part presentation posted as an example of a central role of platelet biology in translational medicine investigations leading to the prevention and control of hemolytic and coagulopathic conditions, and to an understanding of atherosclerotic cardiovascular disease. The study of coagulation traces back to the early work on Warfarin in bleeding, and even earlier than that to the geneological evidence of inherited hemophilia in the Royal family of 18th Century Victoria. The amount of work has been voluminous, and the conceptual framework has been difficult to put into practice over generations of postgraduate physicians. No wonder, considering the clotting proteins and the amazing platelet. Part I of Platelets in Translaional Research is a comprehensive coberage of the signaling and control involved in platelet-endothelial reactions, platelet-platelet reactions, and platelet transciptomics, all of which have a significant bearing on atherosclerotic plaque buildup, plaque rupture, and acute coronary syndrome as well as chronic ischemic heart disease. Part II will cover a range of studies pointing to anti-platelet therapeutic targets. Platelets are specialized disk-shaped cells in the blood stream that are involved in the formation of blood clots that play an important role in heart attacks, strokes, and peripheral vascular disease. In most people, the more than 200 million platelets in a milliliter of blood act as tiny building blocks to form the basis of a clot to stop bleeding from cuts or injuries. Platelets can detect a disruption in the lining of a blood vessel and react to build a wall to stop bleeding. Figure 1. 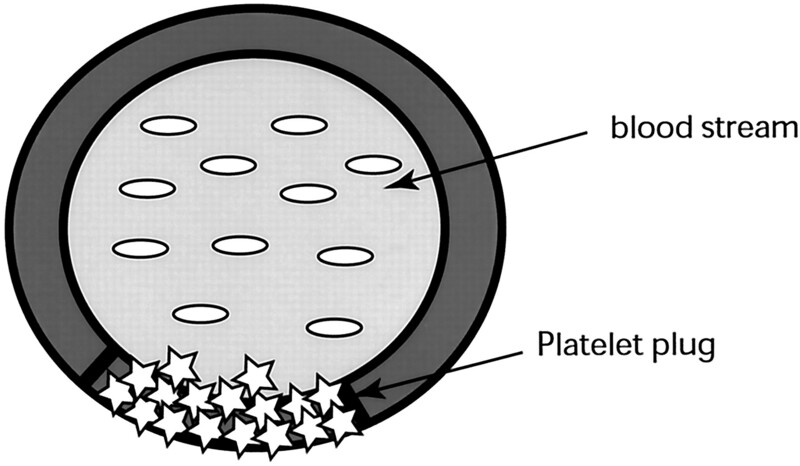 Platelets form a platelet plug to stop bleeding from an injured blood vessel. In cardiovascular disease, abnormal clotting occurs that can result in heart attacks or stroke. Blood vessels injured by smoking, cholesterol, or high blood pressure develop cholesterol-rich build-ups (plaques) that line the blood vessel; these plaques can rupture and cause the platelets to form a clot. Even though no bleeding is occurring, platelets sense the plaque rupture and are confused, thinking that an injury has taken place that will cause bleeding. 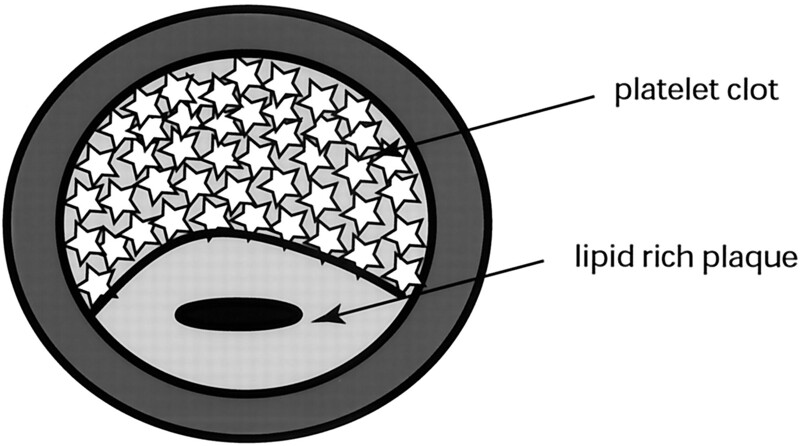 Instead of sealing the vessel to prevent bleeding as would occur with a cut, a clot forms in an intact blood vessel, causing a blockage of blood flow (Figure 2). Without blood, a portion of the heart muscle can die, leading to a heart attack. Platelets may be abnormal either quantitatively (too many or too few) or qualitatively (the right number but they do not work correctly). The number of platelets is routinely tested as part of the complete blood count (CBC). Normal counts range from 150 000 to 450 000. A decrease in the number of platelets indicates a condition known as thrombocytopenia and may result in increased bleeding, the first signs of which may include gum bleeding, nose bleeds, and increased bruising. In cardiology, the most frequent cause of a low platelet count is an abnormal immune response caused by drug therapy, particularly with the intravenous blood thinner heparin (heparin-induced thrombocytopenia), and rarely with other drugs to control high blood pressure or symptoms of congestive heart failure (diuretics), to control diabetes (antidiabetic medications), or to regulate your blood clotting (antiplatelet drugs). Elevated platelet counts can also occur, usually in association with diseases in the elderly, and can result in either excess clotting or even abnormal bleeding. Because platelets are so important in stopping bleeding from everyday injuries such as cuts or bruises, severe inherited disorders of platelets are quite rare. Researchers, however, have discovered more subtle genetic variations in platelets called polymorphisms that may alter platelets in subtle ways to raise the risk of cardiovascular disease when combined with other risk factors, but which on their own do not result in overt disease. These polymorphisms may also be important in understanding who may gain the greatest benefit from anti-platelet drugs. Antiplatelet drugs are different than blood thinners or anticoagulants such as warfarin (Coumadin, Bristol-Myers Squibb) or heparin. Anticoagulants block a second step in clotting known as coagulation but do not directly affect the platelets. Eur J Cardiovasc Nurs. 2002 Dec;1(4):273-88. Willoughby S, Holmes A, Loscalzo J.
GS Abela, PD Picon, SE Friedl, OC Gebara, A Miyamoto, et al. Deaconess Hospital, Harvard Medical School, Boston, Mass; Federal Univ and Univ Passo Fundo (P.D.P. ), Rio Grande de Sul, Brazil; Heart Institute, Univ São Paulo (O.C.G. ), São Paulo, Brazil; National Defense Medical College (A.K. ), Saitama, Jp. It is now recognized that plaque disruption and thrombosis, a process often triggered by activities of the patient, is generally the cause of the onset of acute coronary syndromes. Plaque disruption and subsequent arterial thrombosis are now recognized as critical to the onset of acute coronary ischemic syndromes. It is hypothesized that occurrence of thrombotic coronary occlusion has three components. First, a plaque that is vulnerable to disruption must be present. Second, acute physiological events are required to induce plaque disruption and thrombosis. Third, a relatively hypercoagulable state and heightened vasomotor tone increase the likelihood that arterial thrombosis will produce complete lumen occlusion. In human patients, the opportunity to study factors responsible for acute onset of myocardial infarction is limited because coronary angiography performed before the event cannot prospectively identify plaques vulnerable to disruption. After the event, angiography cannot distinguish the features of the plaque responsible for the disruption from those resulting from the disruption. Moreover, plaque disruptions producing total vascular occlusion and death may be more severe than those occurring in asymptomatic individuals or in patients with unstable angina or nonfatal myocardial infarction. These difficulties, inherent in the study of plaque disruption and thrombosis in human patients, create a great need for an animal model of the process. An atherosclerotic rabbit model of triggering of arterial thrombosis that was introduced by Constantinides and Chakravarti more than 30 years ago but not subsequently used. Aortic plaques were induced by a high-cholesterol diet, by mechanical balloon injury of the artery, or by a combination of the two. Triggering was attempted by injection of Russell’s viper venom (RVV), which is a proteolytic procoagulant, and histamine. A recent review of the animal models of thrombosis currently in use noted that “thus far, it has not been possible to duplicate in a model the most common clinical cause of thrombosis—an ulcerated atherosclerotic plaque.” The advantage of the Constantinides model over other animal models used to study thrombosis is that it uses a biological intervention to trigger localized atherosclerotic plaque disruption and formation of platelet-rich arterial thrombi. Disadvantages of the Constantinides model are (1) the low yield of triggering (only about one third of the rabbits developed thrombosis) and (2) the long (8-month) preparatory period. In addition, there is a need to replicate the findings of Constantinides and Chakravarti13 from 30 years ago because of the biological variability of rabbit strains and RVV. It cannot be assumed that the rabbits and RVV currently available will produce the results obtained in the 1960s. A total of 53 New Zealand White rabbits were exposed to one of four preparatory regimens: rabbits in group I (n=9) were fed a regular diet for 8 months; rabbits in group II (n=13) were fed a diet of 1% cholesterol for 2 months alternated with 2 months of a regular diet for a total of 8 months; rabbits in group III (n=5) underwent balloon-induced arterial wall injury, then were given a regular diet for 8 months; and rabbits in group IV (n=14) underwent balloon-induced arterial wall injury, then were given a diet of 1% cholesterol for 2 months followed by a regular diet for 2 months for a total of 4 months. After completion of the preparatory regimen, triggering of plaque disruption and thrombosis was attempted by injection of RVV (0.15 mg/kg IP) and histamine (0.02 mg/kg IV). In group I, normal control rabbits without atherosclerosis, only one small thrombus was noted in 1 of 9 rabbits. In group II, cholesterol-fed rabbits, thrombosis occurred in 3 of 13 rabbits. Thrombus occurred in all rabbits in group III (5 of 5) and in 10 of 14 rabbits in group IV. Although the frequency of thrombosis was not significantly different between groups I and II, possibly due to a small sample size, it was significantly different among all four groups (P<.001). Also, the frequency and amount of thrombus formation were significantly different among all four groups (P<.001; P<.0001) but not between groups I and II. Rabbits with atherosclerosis (those in groups II and IV) demonstrated plaque disruption and overlying platelet-rich thrombus formation similar to that observed in patients with acute coronary syndromes. The surface area covered by thrombus was 2 mm2 in group I, 15.3±19.2 mm2 in group II, 223±119 mm2 in group III, and 263±222 mm2 in group IV. Rabbits in groups III and IV had the greatest amount of thrombus, and this amount was significantly greater than in rabbits in groups I and II (P<.001 and P<.03, respectively). The intima in group I rabbits appeared normal by gross inspection. In group II rabbits, white-yellow plaque was widely distributed over the arterial surface, with focal punctate ulceration occasionally noted under a dissecting microscope. In group III rabbits, the intima was smooth and widely covered with white plaque. Group IV rabbits had extensive sheets of elevated white-yellow plaque. By gross visualization, ulceration of the surface was present without superimposed thrombus in two rabbits in group IV. In sections from groups II and IV, some areas of plaque directly adjacent to the thrombi had marked thinning of the connective tissue cap and areas of dehiscent foam cells. These observations were rare and were noted in <0.5% of the examined lesions. In most cases, the arterial thrombus was not located at a site of obvious plaque rupture. Foam cell infiltration was also noted adjacent to sites of thrombosis. Scanning electron microscopy demonstrated fissures of various lengths below areas from which overlying thrombi were removed. Endothelial cells could be seen lining the intimal surface of the aorta in the rabbits that had undergone balloon-induced arterial wall injury 8 months earlier. Surface blebs and focal endothelial breakdown with ulcer formation, without grossly visible thrombosis, were occasionally seen in samples from groups II and IV. The base of these ulcers was layered with platelets, fibrin, and red blood cells. Transmission electron microscopy of areas with thrombosis confirms that the thrombi were platelet rich. In the two groups that received cholesterol feeding, the total cholesterol content in tissue samples pooled from the thoracic and abdominal aorta was significantly higher in group IV (16±7.2 mg/g) than in group II (2.8±1.6 mg/g) (P<.0001). Rabbits that were maintained on a regular diet (groups I and III) had equally low levels of tissue cholesterol (0.05±0.04 versus 0.06±0.02 mg/g, P=NS). The average fibrinogen level before triggering in the 27 rabbits in which fibrinogen was measured was 210±119 mg/dL; it rose to 403±168 mg/dL 48 hours after triggering (P<.001). Plasma fibrinolytic activity did not change after triggering (85.5±37.8 versus 94.8±33.5 arbitrary units). Platelet counts (measured in only 19 rabbits in groups II and IV) decreased from 350±84×103 to 215±116×103 per cubic millimeter after triggering (P<.001). 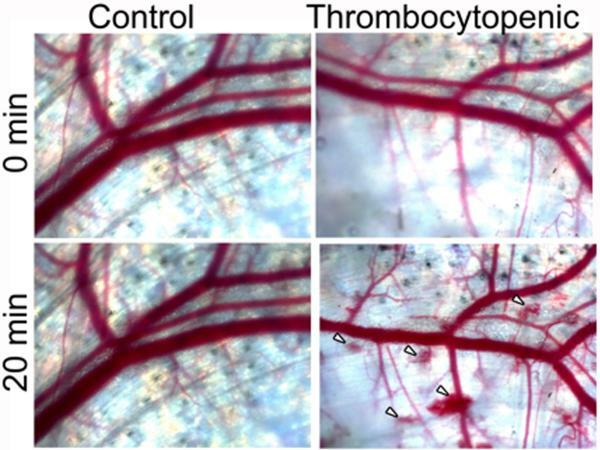 The results demonstrate that vulnerable plaques can be produced and that plaque disruption and platelet-rich arterial thrombus formation may be triggered pharmacologically in an animal model of arterial plaque. This finding documents that the New Zealand White rabbit strains and the RVV currently available can be used to obtain the same results observed by Constantinides and Chakravarti13 more than 30 years ago. This animal model is suitable for the study of plaque disruption and arterial thrombosis. Hypercholesterolemia and mechanical arterial wall injury seemed to produce plaques vulnerable to triggering of disruption and thrombosis, whereas normal arteries were relatively resistant to triggering. The model provides a method to evaluate agents that might decrease the occurrence of vulnerable plaques or the amount of thrombus formed after triggering. Most important, the model can be used to identify the features of vulnerable plaques and the pharmacological stressors that trigger plaque disruption and thrombus formation. Certain features of the lesions seen in this model are similar to those of human lesions seen at autopsy of patients with fatal myocardial infarction, ie, a lesion with a fissured collagen cap overlying a lipid mass of amorphous and crystalline lipid. However, most of the lesions in the model did not have these features and were more consistent with a recent pathological study of fatal coronary thrombosis, which revealed that in approximately half the cases, the plaque was relatively intact but an inflammatory infiltrate was present. Perhaps the incidence of plaque rupture causing thrombus may be even lower in patients with nonfatal coronary thrombosis, as suggested from angioscopic studies of coronary arteries that have shown plaque ulceration of various severities. Analyses of human plaques have demonstrated that disrupted plaques have significantly less collagen, glycosaminoglycans, and smooth muscle cells and more extracellular lipid and macrophages than do nondisrupted plaques. This is consistent with findings in our study that rabbits in group II had more connective tissue and a lower rate of disruption and thrombosis than those in groups III and IV. Herrick JB. Clinical features of sudden obstruction of the coronary arteries. JAMA. 1912;59:2015-2020. Chapman I. Morphogenesis of occluding coronary artery thrombosis. Arch Pathol. 1965;80:256-261. Friedman M, van den Bovenkamp GJ. The pathogenesis of a coronary thrombus. Am J Pathol. 1966;80:19-44. This reader sees a validation in this study of the noted cardiologist, Alan Jaffe, at Mayo Clinic, in referring to Type I and Type II myocardial infarcts, which accounts for differences in troponin elevations in patients. Davies MJ, Woolf N, Rowles PM, et al. Morphology of the endothelium over atherosclerotic plaques in human coronary arteries. Br Heart J 1988;60:459-64. Inoue M, Itoh H, Ueda M, et al. Vascular endothelial growth factor (VEGF) expression in human coronary atherosclerotic lesions: Possible pathophysiological significance in progression of atherosclerosis. Circulation 1998;98:2108-16. Collagen is sufficient to capture and activate platelets under venous wall shear rates (ãw 100–200s_1). In the arterial circulation (ãw 1000–2000 s_1), collagen adsorbed von Willebrand factor (vWF) facilitates platelet capture, allowing col­lagen induced GPVI signaling and subsequent á2â1 and á2bâ3 activation. Under flow conditions, red blood cells help enrich the platelet concentration by 3–8x in the plasma layer near the wall. At pathological high shear exposures (>5000 s_1) encountered in severe stenosis, mechanical heart valves, and continuous LVAD pumps, the plasma vWF may undergo structural changes, such as a transition from a globular to an extended state (Schneider et al., 2007), likely increasing the availability of A1 domains in the vWF polymer for multivalent contacting with platelet GPIb receptors. Collagen triggers GPVI clustering, leading to rapid phosphorylation of the GPVI-associated Fc receptor by Src family tyrosine kinases. Such phosphotyrosine residues are recognized by Syk, and the binding and activation of Syk activates PLCã2. PLCã2 converts phosphatidylinositol (PI)-4,5-P2 (PIP2) to inositol 1,4,5-trisphosphate (1,4,5-IP3 or IP3) and diacyclglycerol (DAG). IP3 opens Ca2+ channels in the platelet dense tubular system (DTS). Depletion of DTS Ca2+ results in STIM1 activation and bind­ing to Orai1, leading to store operated calcium entry (SOCE). DAG/Ca2+ activates protein kinase C (PKC) in platelets, which in turn governs several serine/threonine phosphorylation events. Beyond the first monolayer of platelets adherent to colla-gen/VWF, the addition of subsequent layers of platelets to the growing thrombus is strongly potentiated by locally released ADP and thromboxane (TXA2) as well as locally generated thrombin. ADP activates P2Y1 and P2Y12 while TXA2 activates the TP receptor and thrombin cleaves PAR1 and PAR4. Activation of a GPCR causes an exchange of GTP for GDP on the α subunit of the G protein and dissociation of the α and γ subunits. Both these units in turn interact with secondary effectors such as PLC and adenylate cyclase. Human platelets express at least 10 forms of Gα (including members of the Gq, Gi, G12, and Gs fami­lies) (Brass et al., 2006; Offermanns, 2006). Thrombin, ADP, and TXA2 activate PLC via Gq. PLC generates IP3 from membrane PIP2. Rising Ca2+ levels activate the Ras family member, Rap1B via Cal-DAG GEF. Rap1B activation is a precursor to αIIb 3 acti­vation and allows the platelets to form aggregates with other platelets through fibrinogen cross-bridging. Ca2+-dependent signaling drives myosin light chain kinase and activation of GTP binding proteins of the Rho family. Rho acti­vation in turn activates kinases like p160ROCK and 5 LIM-kinase that can phosphorylate myosin light chain kinase and cofilin to regulate actin-dependent cytoskeletal shape changes. Endothelial derived prostacyclin (PGI2) binds the IP recep­tor and causes Gs mediated increase in adenyl cyclase activity. Also, NO from the endothelium and platelets can activate guany-late cyclase resulting in elevated cGMP levels that subsequently inhibit the hydrolysis of cAMP by intracellular phosphodi-esterases. Taken together these mechanisms elevate intracellular cAMP levels, which strongly downregulate platelet signaling. Agonists coupled to Gi family members inhibit cAMP production in platelets, thus allowing activation to proceed unhindered. Additionally the âã subunits of these receptors can activate PLCâ and the ã isoform of PI3K. The effectors for PI3K include Rap1b and Akt. FIGURE 1 | Detailed reaction schemes for platelet signaling modules. Four interconnected models were defined: (A) Ca2+ module: cytosolic and DTS compartments are separated by the DTS membrane, which contains the IP3R and SERCA. (B) Phosphoinositide (PI) module: Membrane-bound PIs are cleaved by PLC-â to form diffusible inositol phosphates and DAG, which are substrates for resynthesis of PIs. (C) PKC module: Ca2+i and DAG activate PKC, which migrates to the plasmamembrane where it phosphorylates PLC-â. (D) P2Y1 module: extracellular ADP binds to and activates P2Y1. Active P2Y1 accelerates guanine nucleotide exchange on bound Gq. The Gq·GTP binds and activates PLC-â, which increases the GTPase activity of Gq·GTP. ADP is stored in platelet dense granules and is released upon activation. P2Y1 and P2Y12 are the primary receptors for this agonist. P2Y1 is Gq coupled and signaling through this receptor causes Ca2+ mobilization, shape change, and thromboxane generation. P2Y12 is the target of the commonly used anti-platelet drug Plavix, and is a Gi2 coupled receptor that inhibits cAMP production in platelets. Thrombin is a potent platelet agonist that causes fast mobi­lization of intracellular Ca2+, and activation of phospholipase A2 and subsequent thromboxane generation (Offermanns et al., 1997). Also, thrombin can trigger Rho dependent signaling pathways in platelets (Moers et al., 2003), that contribute to actin modeling and shape change. Thrombin signals through the protease-activated receptor (PAR) family of GPCRs. PAR1 and PAR4 are expressed on human platelets, while PAR3 and PAR4 are expressed on mouse platelets. Thrombin cleaves the N-terminus of these receptors, exposing a new N-terminus that serves as a tethered ligand for these receptors. Synthetic pep­tides are able to selectively activate these receptors and mimic the actions of thrombin (for example, SFLLRN for PAR1, and AYPGKF for PAR4). Kinetic studies have shown that the human platelet response to thrombin is biphasic and involves first signal­ing through PAR1 and subsequent signaling through PAR4 (Covic et al., 2000). In mouse platelets signaling occurs primarily via PAR4, and is facilitated by PAR3. In addition to the PAR recep­tors, GP1bá has high affinity for thrombin. Absence of GP1bá reduces responses to low doses of thrombin and diminishes PAR1 signaling, suggesting that this receptor facilitates signaling through the PARs (Dormann et al., 2000). Ca2+ mobilization also activates phospholipase A2 (PLA2), which in turn converts mem­brane phospholipids to arachidonic Acid. TXA2 is produced from membrane arachidonate by the aspirin sensitive cyclooxygenase (COX-1) enzyme. TXA2 causes Ca2+ mobilization, aggregation, secretion, phosphoinositide hydrolysis, and protein phosphoryla-tion. TXA2 can diffuse across the membrane and activate nearby platelets, but its activity is limited by the molecule’s short half life (∼30 s). 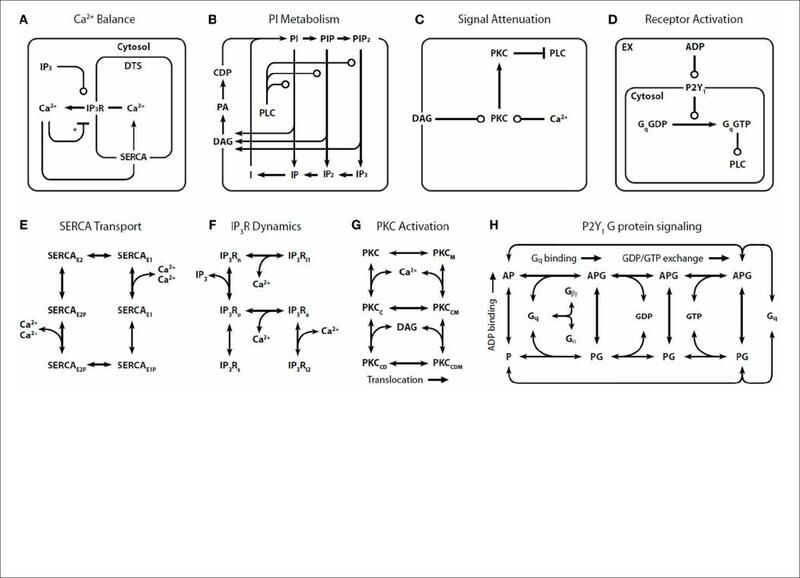 These modules use previously validated or data-consistent kinetic networks for SERCA, IP3-Receptor, PKC translocation, and GPCR signaling (Figures 1E–H). Assembling the four modules together results in a global ODE model that has 77 reactions, 132 fixed kinetic rate constants, and 70 species. Since the reaction network (Figure 1) and the kinetic parameters are fixed, the reaction topology of the model is also fixed. Such a model takes the general form: dc/dt = F(c) and c(t = 0) = co where c is a vector of all species concentrations and co is a specified initial condition vector at t = 0. To determine appropriate sets of co that are suitable for use in modeling platelets, a challenge exists that the copy number of each species in a resting platelet is not known. Imposing a homeostasis assumption results in powerful tool to define a set of acceptable co vectors. The homeostasis assumption states that a resting platelet remains resting until activated. This means that an acceptable ini­tial condition co also represents a steady state for the system and will satisfy the equation dc/dt = 0. Finding a global co involves assembling the steady state solutions of each module (Figure 2). 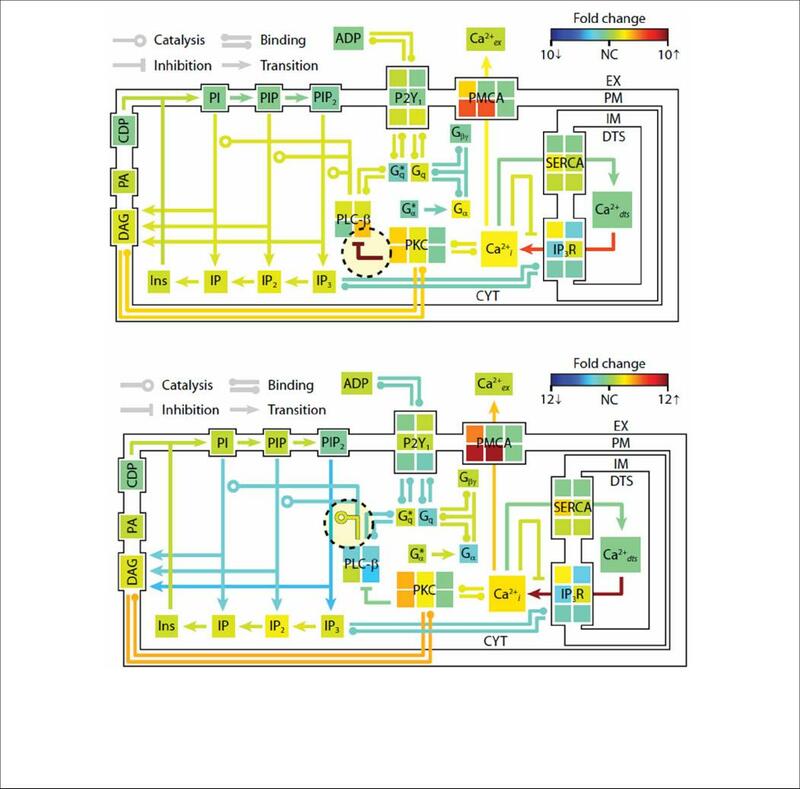 FIGURE 2 | Homeostasis requirement: Assembly of full model from steady-state modules using principle component analysis (PCA). The full model is assembled by combining PCA-reduced, steady-state solution spaces from each module into a combined steady state solution space. This global space is searched for full-length, steady-state solution vectors that satisfy both the steady state requirements of each module and the desired time-dependent properties when the steady-state is perturbed. A simple linear constraint is imposed for every pair of modules that share a common molecule ci to ensure that steady state solutions are Keywords: platelet, thrombosis, hemodynamic, ADP, thromboxane consistent. 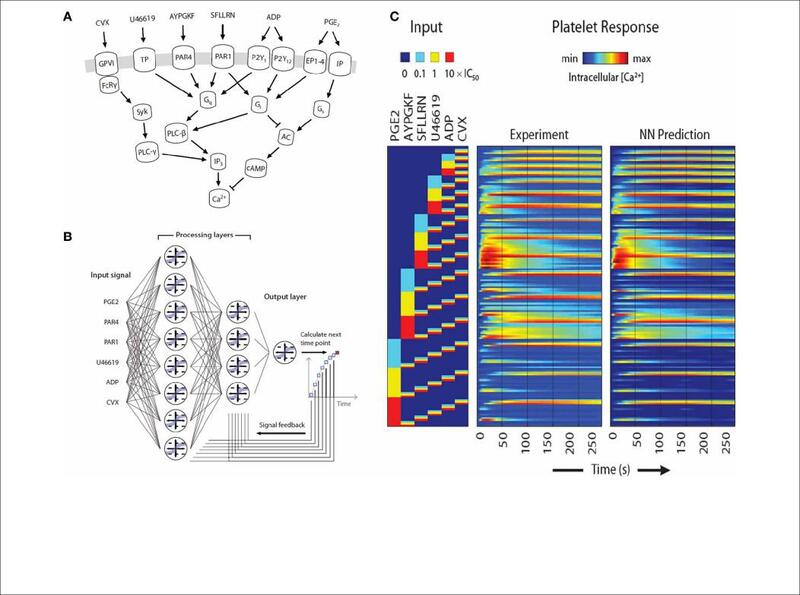 To assemble the platelet signaling model, a set of 16 PC vectors representing all 72 unknown variables in the model were used as search directions in a global optimization routine. The global solution space was searched for models with accurate dynamic behavior using experimental time-series data for ADP-stimulated Ca2+ release. Species are grouped according to compartment. Color values correspond to molar concentrations (mol/L or mol/m2) or as indicated: ∗DTS species (mol L−1). †Extracellular species (mol L−1). ‡DTS volume (L). §PM leak conductance/area (S m−2). The first phase of the method involves generating a com­pact representation of the steady-state solutions for each module. First, conservative bounds are chosen for c based on physiological and practical considerations. Also, because molecular concentra­tions can span several orders of magnitude, it is most efficient to delineate this range of values on a logarithmic scale rather than a linear scale. Once the sampling distribution for c has been defined, steady-state solutions (co = c55) for each module are cal­culated using fixed kinetic parameters for each reaction in the module. For non-oscillating systems, steady-state solutions may be obtained by simulating the system until equilibrium is reached (i.e., until dc/dt = 0). In the third step, a large collection of steady-state solutions for each module is subjected to principal component analysis (PCA) (Purvis et al., 2009). PCA is then used to transform these points to a new coordinate set that optimally covers the space of steady-state solutions using the fewest num­ber of dimensions. For example, if two molecule concentrations in the steady-state space are highly correlated due to participation in the same reaction, PCA will locate a single dimension to rep­resent each pair of points in the transformed space. Ultimately, these new dimensions will be combined across all modules to search for global solutions that lie in the steady-state space for the fully combined network. Since PCA is a linear method, a steady-state solution space that is highly nonlinear may require more principal component vectors to accurately estimate the solutions. The reduction procedure is shown for the human platelet model comprising 4 interlinked signaling modules (Figure 2). For this step, we generated more than 109 sets of initial guesses (co) for each module, computed the initial value problem for each co until a steady state was reached (dc/dt ≈ 0), and selected only those steady states (c55) that were consistent with known con­centrations (i.e., [Ca2+]o ∼100 nM). Interestingly, only a small fraction of initial guesses produce steady-state solutions that are also consistent with known concentration values. For example, it was shown that only 50,000 of 109 initial guesses (0.005%) in the Ca2+ balance module (Figure 1A) met both requirements and were suitable for further analysis. This observation shows that the kinetic topology of these molecular networks places very strong constraints on the range of concentrations that can exist at steady state. In biological terms, this suggests that fixed kinetic proper­ties at the molecular level (e.g., IP3R and SERCA kinetics) can affect not only the dynamical features of a biochemical system but can also determine the abundance of chemical species and the compartmental structures that contain them. A fully assem­bled initial condition vector results (bottom, Figure 2) results in new hypotheses about allowable concentrations and ratios of con­centrations (i.e., IP3/SERCA ratio is very small). The allowed co = css is consistent with the known resting levels of Ca2+, IP3, P2Y1, DAG, PA, PI, PIP2, and PIP (bottom, Figure 2) as well as the stimulated response of platelets to increasing amounts of ADP (right, Figure 2). With a global simulation of P2Y1 signaling, it is possible to simulate the ADP dose-response of calcium mobiliza­tion and IP3 generation in platelets as well as the mobilization of intracellular calcium in a single platelet due to stochastic fluctuations (Figure 3). FIGURE 3 | Tests of P2Y1 signaling model. ADP dose response for the full platelet model from 100 nM to 10 ìM ADP for calcium mobilization (A) or IP3 generation (B). Stochastic simulation of a single platelet (C). A single, fura-2-loaded platelet was immobilized on a fibrinogen-coated coverslip and activated with 40 ìM ADP at t = 90 [Ca2+ trace from Heemskerk et al. (2001)]. 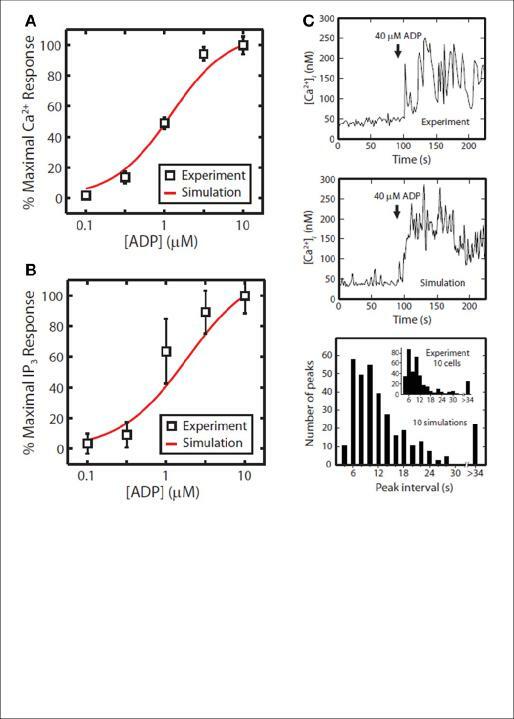 After 90 s of simulated rest, the platelet model was activated by setting extracellular [ADP] to 40ìM. Simulated interval times were binned in 2s increments for direct comparison with experiment (inset). Since many initial condition vectors can be found to allow a resting platelet to remain resting and then respond appropriately to stimulation, investigation of these multiple steady states and associated cell responses can allow an ad-hoc sensitivity analysis. Some species (flexible nodes) may vary widely in the allowed ini­tial condition vectors but have little effect on system response. In contrast, other species (rigid nodes) may be forced to take on val­ues in a very narrow range due to the kinetic constraints of the problem. in steady-state PIP2 hydrolysis, elevated IP3 concentration, and accelerated Ca2+ release. This was a compensatory effect caused by the negative feedback loop involving Ca2+-regulated activity of PKC, a resulting new hypothesis that can be probed experi­mentally. In another example, increasing the hydrolytic activity of PLC-â for the substrate PIP2 by 10-fold caused an expected stimulatory effect, raising intracellular calcium and steady-state levels of cytosolic inositol phosphates (IP3, IP2, and IP) between 2- and 3-fold. Interestingly, reaction fluxes for phosphoinositide hydrolysis were diminished, possibly due to substrate depletion. Taken together, these examples illustrate the system-wide effects of perturbations in the kinetic rate processes. The procedure could easily be extended to examine multiple simultaneous per­turbations in both reaction rates and steady-state concentrations. In future applications of this approach, genomic or proteomic information of multiple perturbations could be used to help predict platelet signaling phenotypes. FIGURE 4 | Shifts in steady-state profiles caused by kinetic perturbations. The steady-state platelet model was perturbed by changing selected kinetic parameters (±10-fold) and simulating for 1 h. After approaching a new steady state, the model concentrations and fluxes were determined relative to their original steady-state values and colored according to fold-change. Green indicates no change (NC) relative to initial flux/concentration. Red indicates a relative increase and blue indicates a relative decrease. Note that the color scale in each panel is normalized separately to maximize distinctions in fold change. New steady states were achieved after (top) 10-fold decrease in PKC-mediated inhibition of PLC-β, and (bottom) 10-fold increase in PIP2 hydrolysis (10-fold increase in kcat of hydrolysis). ∗, active state. FIGURE 5 | Pairwise agonist scanning to predict global calcium response in human platelets. (A) Simplified schematic of signaling pathways examined in this study that converge on intracellular calcium release in human platelets. (B) Dynamic NN model used to train platelet response to combinatorial agonist activation. A sequence of input signals representing agonist concentrations is introduced to the network at each time point. Processing layers integrate input values with feedback signals to predict the next time point. (C) A total of 154 calcium traces were measured for single and pairwise activation using 6 different agonists (“Experiment”) and used for neural network training. The NN training accurately predicted (“NN Prediction”) the training data. FIGURE 6 | Multiscale modeling. The multiscale model has four main components (A) fluid flow, transport of soluble species, motion and binding of platelets, and the activation state of each platelet. The fluid flow is perturbed by the growing clot and is determined using the lattice Boltzmann method. The released soluble agonists form a boundary layer in the flow, and this process is determined using the finite element method. Platelet motion and bonding are simulated with lattice kinetic Monte Carlo. Platelet activation state is estimated from the history of intracellular calcium concentration, which is determined by a neural network model. (B) Multiscale simulation of patient-specific platelet deposition under flow for a specific donor and PAS-trained neural network of calcium signaling. Platelet activation (black, unactivated; white, activated) and deposition at 500 s (inlet wall shear rate, 200 s−1) showing released ADP (top) and TXA2 (middle) and perturbation of the flow field (bottom). Flow: left to right (streamlines, black lines); surface collagen (250 ìm long): red bar. The multiscale systems biology model accommodates platelet sig­naling, platelet adhesion to collagen and other activated platelets, release of soluble agonists, thrombus growth, and distortion of the prevailing flow field (Figure 6A). The lattice Boltzmann (LB) method is used to solve for the velocity field of the fluid. Platelets in the growing aggregate release ADP and TXA2 into the fluid, and a boundary layer is formed with the flow. The dynamics of this process are determined with a finite element method solution of the convection-diffusion-reaction equation for each of the soluble species, ADP and TXA2. Platelets move in the fluid by convection and RBC-augmented dispersion. They also bind to the collagen surface as well as previously bound platelets. The motion and binding of platelets is simulated using the convective lattice kinetic Monte Carlo (LKMC) algorithm validated for stochastic convective-diffusive particle transport (Flamm et al., 2009, 2011, 2012). The level of integrin activation and associated adhesiveness for each platelet is related to the cumulative intracellular calcium concentration. The intracellu­lar calcium concentration is determined using a NN trained on a specifc patient’s platelet PAS phenotyping experiment. Using this multiscale approach, Multiscale simulations predicted the density of platelets adherent to the surface, platelet activation states, as well as the spatiotemporal dynamics of ADP and TXA2 release, morphology of the growing aggregate, and the distribu­tion of shear along the solid-fluid boundary (Figure 6B). Platelets stick to the collagen surface and release ADP and TXA2 which forms a boundary layer extending up to 10 pm from the throm­bus. Boundary layer concentrations of up to 10 pM ADP and 0.1 pM TXA2 were found by simulation. TXA2 concentrations were found to be sub-physiological (<0.0067 pM or <0.1 xEC50) until a sufficient platelet mass accumulated at the surface after ∼250 s. Boundary layer ADP concentrations were within the effective dynamic range (0.1–10 pM) throughout the simulation. The strong temporal and spatial fluctuations in the concentration of ADP were predominately driven by the short release time (5 s), whereas the longer release time of TXA2 (100 s) smoothed fluc­tuations. The shear rate along the solid-fluid boundary became nonuniform during the simulation (5–10-fold increase above 200 s−1) due to surface roughness. At 500 s, the platelet deposit was characterized by platelet clusters 20–30 pm in length, fully consistent with microfluidic measurements of platelet cluster size on collagen at this shear rate. Developing tools to define platelet variations between patients and the relationship of platelet phenotype to prothrombotic or bleeding traits will have significant impact in stratifying patients according to risk. This multiscale approach also makes feasible patient-specific prediction of platelet deposi­tion and drug response in more complex in vivo geometries such as stenosis, aneurysms, stented vessels, valves, bifurcations, or ves­sel rupture (for prediction of bleeding risks) or in geometries encountered in mechanical biomedical devices. Summary: The adhesion of both leukocytes and platelets to microvascular endothelial cells has been implicated in the pathogenesis of ischemia/reperfusion (I/R) injury in several vascular beds. The objectives of this study were to (1) assess the platelet–leukocyte–endothelial cell interactions induced in the cerebral microvasculature by middle cerebral artery occlu­sion (MCAO)/reperfusion, and (2) define the molecular deter­minants of the prothrombogenic and inflammatory responses in this model of focal I/R. MCAO was induced for 1 hour in wild-type (WT) mice, WT mice treated with a monoclonal antibody (mAb) to either P-selectin or GPIIb/IIIa, and in P-selectin−/−(P-sel−/−) chimeras. Isolated platelets labeled with carboxyfluorescein diacetate succinimidyl ester (CFDASE) were administered intravenously and observed with intravital fluorescence microscopy. Leukocytes were observed after in­travenous injection of rhodamine 6G. One hour of MCAO fol­lowed by 1 hour of reperfusion resulted in the rolling and adhesion of leukocytes in venules, and after 4 hours of reperfusion, the adhesion of both leukocytes and platelets was de­tected. Although both the P-selectin and GPIIb/IIIa mAbs sig­nificantly reduced the adhesion of leukocytes and platelets at 4 hours of reperfusion, the antiadhesive effects of the P-selectin mAb were much greater. The leukocyte and platelet adhesion responses were significantly attenuated in both P-sel−/−-WT and WT-P-sel−/− bone marrow chimeras, compared with WT-WT chimeras. Neutropenia, induced by antineutrophil serum treatment, also reduced the recruitment of leukocytes and platelets after cerebral I/R. These findings implicate a ma­jor role for both platelet-associated and endothelial cell– associated P-selectin, as well as neutrophils in the inflamma­tory and prothrombogenic responses in the microcirculation after focal cerebral I/R. The I/R-induced recruitment of rolling and adherent leuko­cytes was significantly attenuated in P-selectin mAb-treated mice, compared with the responses noted in untreated mice exposed to 1-hour MCAO and 4-hour reperfusion (Figs. 3A and 3B). However, the number of adherent leukocytes after P-selectin mAb treatment remained elevated above the level de­tected in sham experiments. Both the rolling and firm adhesion of platelets was reduced to sham levels in the P-selectin mAb-treated mice. Although treatment with a GPIIb/IIIa mAb sig­nificantly reduced the adhesion of both platelets and leukocytes after I/R, the reductions noted were relatively small compared with the responses seen with the P-selectin mAb. Our findings related to the role of platelet-associated and endothelial cell–associated P-selectin in mediating the I/R-induced rolling and adhesion of leukocytes and platelets are summarized in Fig. 4. In P-sel / -WT chimeras, the number of rolling and adherent leukocytes were significantly but not completely reduced compared with WT—WT chimeras. However, compared with WT—WT chimeras, the rolling and firm adhesion of platelets was virtually abolished after I/R. In WT—P-sel−/− chimeras, the number of rolling and adherent leu­kocytes and platelets also decreased significantly com­pare with WT—WT chimeras; however, some adhesion of leukocytes and platelets was still detected after I/R, similar to the responses noted in the group treated with the P-selectin blocking mAb. Platelets were noted to adhere directly onto adherent leukocytes and platelet-bearing leukocytes were occa­sionally observed rolling in postischemic venules. Some free-flowing platelets were seen to suddenly bind (with-out rolling) on adherent leukocytes. Some of these plate­lets detached from the adherent leukocyte whereas others adhered firmly on the leukocyte. Other platelets were seen to roll and adhere directly on venular endothelium. To quantify the contribution of leukocytes to I/R-induced platelet recruitment, some mice were rendered neutropenic with antineutrophil serum. Although leuko­cyte rolling and adherence were still observed in cerebral venules of serum-treated mice after I/R, the responses were dramatically reduced. The cerebral venules of neutropenic mice also exhibited large and significant reduc­tions in rolling and adherent platelets after I/R (Fig. 5). FIG. 4. 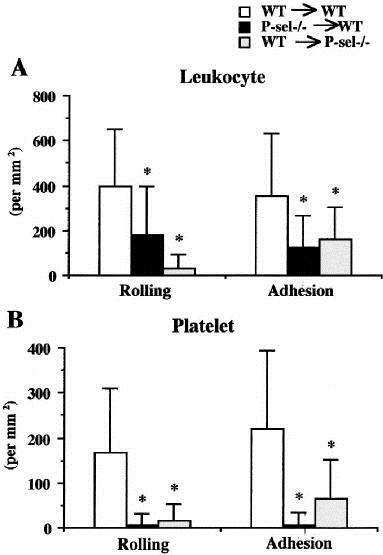 Role of platelet-associated and endothelial cell–associated P-selectin in mediating I/R-induced rolling and adhesion of leuko­cytes (A) and platelets (B). Four or five animals were studied in each group. Mice in all groups were exposed to 1 hour of MCAO followed by 4 hours of reperfusion. WT—*WT and WT—*P-sel−/− chi­meras received CFDASE-labeled platelets from WT mice. P-sel−/−—*WT chimeras received CFDASE-labeled platelets from P-sel−/− mice. *P < 0.05 relative to the WT*WT (control) chimeras. This article is part of a multi-part CME-certified activity titled Translational Therapeutics at the Platelet Vascular Interface. The acute hemostatic functions of platelets are well known, have dominated the attention of the field for decades, and have been the founda­tion for discoveries that generated new molecular therapies. Rapid, immediate activation responses mediate platelet-dependent thrombosis in a variety of pathologic conditions, and pharmacological antiplatelet strategies are largely aimed at these events. Nevertheless, the focus on adhesion, aggre­gation, and secretion, and the view that platelets have a repertoire of activities primarily restricted to these acute processes, have also generated a central dogma that may inappropriately limit our view of their actions at the vascular interface and in other settings in health and disease. Clearly, our understanding of the molecular mechanisms by which platelets influence hemostasis, thrombosis, regulated and dysregulated inflammation, and neoplasia remains incom­plete and continues to evolve. New paradigms are emerging as previously unrecognized pathways in platelets are identi­fied, and unanticipated activities are characterized. In this regard, the current state of the field of platelet biology may be akin to that of endothelial cells several decades ago, when endothelium was thought by most investigators and physi­cians to have a limited range of responses; on the contrary, however, when this dogma was reexamined using new approaches that included primary culture of human endothe-lium, active participation of these cells in interactions with leukocytes and a variety of other previously unrecognized functions were discovered. If the comparison is accurate, new paradigms relevant to activities of platelets at the vascular interface are likely to be reported with some frequency. Alternative and traditional views of selected features of platelet biology are listed in the Table. There is already considerable evidence for some of the alternative themes, such as inflammatory and immune activities of platelets,10–16 whereas others are less well explored and more speculative. The remainder of this review summarizes evidence for one such functional capability not generally recognized in plate­lets until recent discoveries revealed it: synthesis of new protein products in response to cellular activation (reviewed in references5,17). 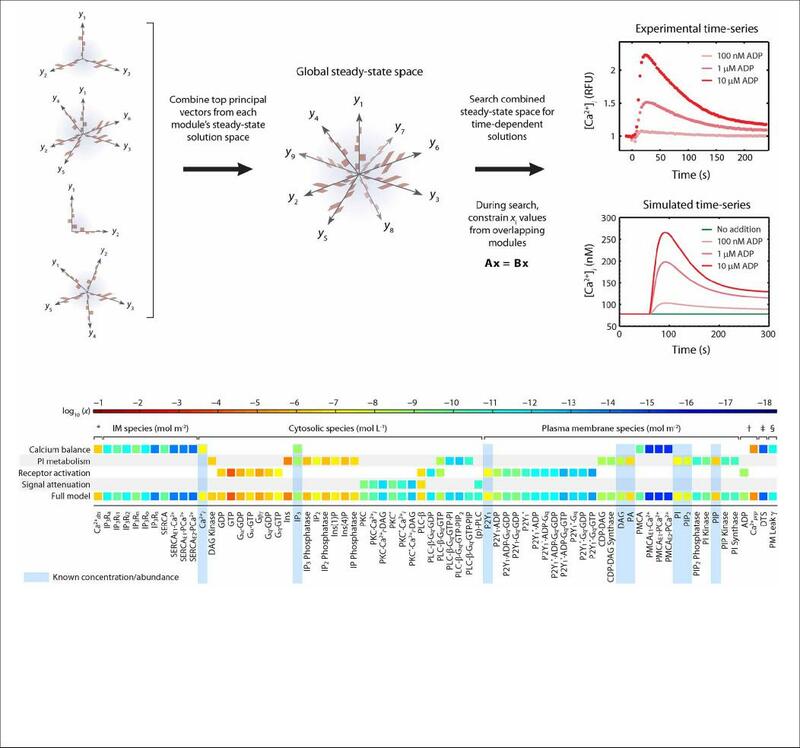 Observations from a number of laboratories now demonstrate that physiologically relevant activation signals induce translation of proteins with impor­tant functions from constitutive or posttranscriptionally pro­cessed messenger RNAs (mRNAs) in human and murine platelets, a process that we have termed signal-dependent translation. These and other studies indicate that the platelet has intricate posttranscriptional mechanisms that allow it to alter its proteome, phenotype, and functions by accomplish­ing new protein synthesis in response to cellular activation. This capacity may allow platelets to modify the complex milieu of the vascular interface in ways that were previously unrecognized. Essentially, all of the platelets isolated from normal subjects incorporated radiolabeled amino acids into new protein, demonstrating that this function is not a property of a subset of immature cells. Platelets from splenectomized subjects with idiopathic throm-bocytopenic purpura had increased levels of amino acid incorporation into protein, indicating that the physiological state of the subject or the age and maturity of the platelets influence protein synthesis. Extracellular factors were re­ported to alter protein synthesis by human platelets under some conditions. This provided evidence suggesting that the synthetic mechanisms involved are regulated. Circulating human platelets have a substantial and diverse transcriptome, in addition to protein synthetic machinery. RNA-selective fluorescent dyes stain the entire population of platelets isolated from normal subjects, indicating the presence of RNA species transcribed by parent megakaryocytes. Messenger RNAs with 5′-methylguanosyl (m7G) caps and 3′ untranslated region polyadenylated tails are present, as are 18S and 28S ribosomal proteins, which are integral to the structure of ribo-somes. Early experiments with intact platelets from nor­mal subjects indicated that some of the mRNA transcripts are competent to serve as templates for proteins and have relatively long functional half lives that correlate with the lifespan of platelets in the circulation. This observation then lay fallow, for the most part, until the advent of reverse transcriptase polymer-ase chain reaction (RT-PCR) analysis and cDNA cloning meth-odologies. This infusion of new technology resulted in construction of cDNA libraries from platelet transcripts. 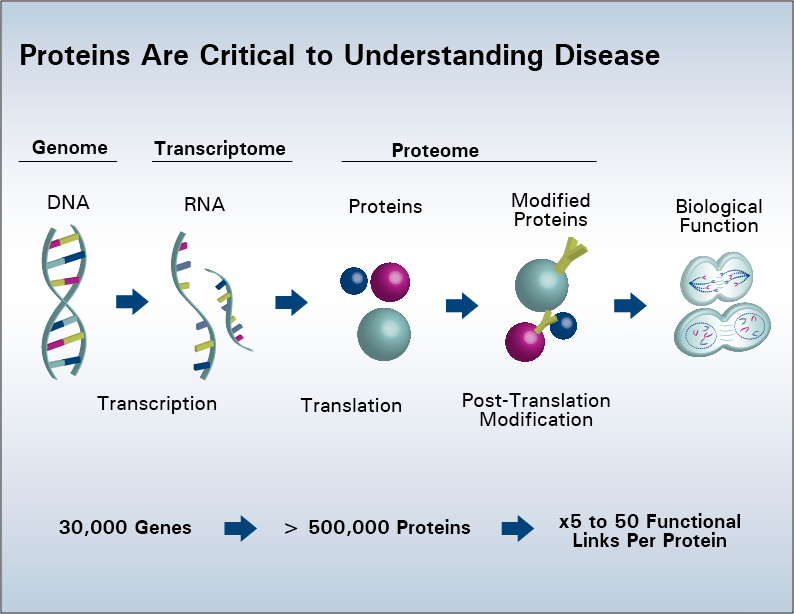 Most recently, transcript profiling by microarray analysis and serial analysis of gene expression (SAGE) have been applied to platelets, identifying 1500 to 3000 unique transcripts in platelets from normal subjects, depending on the approach. Both cytoplasmic and mitochondrial transcripts are represented.35 There is substantial consistency between data generated by microarray analysis and SAGE, and in platelets isolated from different normal donors. Although early studies indicated that platelets have protein synthetic capacity, the general concept in the field has been that it is low level, vestigial, and likely inconsequential. Several texts of hemostasis and platelet biology do not mention this function, and some commentaries conclude that platelets are simply incapable of any new protein synthesis. Consistent with the notion that platelets have low basal protein synthesis, little incorporation of the radiolabeled amino acid is detectable when freshly isolated human plate­lets are incubated with [35S] methionine under resting condi­tions in the absence of activation. However, when an activat­ing signal is delivered to platelets incubated in parallel, multiple labeled proteins are synthesized when lysates and soluble fractions are analyzed by 1-dimensional or 2-dimensional gel electrophoresis (Lindemann S, Weyrich AS, Zimmerman GA, 2001). Some of these newly synthe­sized proteins have been identified and mechanisms of their signal-dependent translation determined. Recent findings provided clear evidence for signal-dependent (that is, induced by activating signals) translation of Bcl-3 from mRNA that is transcribed in parent megakaryocytes but is repressed, or “silenced,” in circulating platelets under resting, basal conditions. Immunocytochemical de­tection of Bcl-3 in platelets in inflamed and thrombosed human vessels in surgical specimens (Figure 1D) provided in situ evidence that the experimental observations have physi­ological and clinical relevance. We subsequently found that collagen, platelet-activating factor, ADP, and epinephrine are also agonists for signal-dependent translation in plate-lets. Collagen was recently reported to induce Bcl-3 synthesis by platelets in experiments by other investigators. The time course of Bcl-3 synthesis in response to thrombin yielded additional important insights: newly synthesized Bcl-3 could be detected in activated platelets within 15 to 30 minutes in some experiments, consistent with translation of constitutively present mRNA without a requirement for new transcription. This feature is also consistent with the biology of platelets as rapid response cells. Nevertheless, synthesis of Bcl-3 is also prolonged over many hours, indicating that platelets may have important functions in thrombi and injured vessels well beyond the first few minutes of acute activation. Discovery of synthesis of Bcl-3 by activated platelets sparked a search for the identities of other protein products, yielding IL-1J3 and TF. It also led to the unexpected discovery that their synthesis is preceded by signal-dependent cytoplasmic splicing of IL-1J3 and TF pre-mRNAs, yielding mature transcripts that are translated into precursor (IL-1J3) and active (TF) proteins.24,43,44 This identified a novel mechanism not previously recognized in activated mammalian cells. The splicing capacities of activated platelets are intricate and will be reviewed separately. Signal-dependent splicing, to­gether with the mTOR-dependent translational control mech­anism and other regulatory pathways discussed here, indicate that platelets have unexpected diversity in posttranscriptional control. Previous and ongoing studies add to this conclusion and suggest that platelets may also use ribosomal “stalling” or polypeptide termination, participation of micro RNAs (Denis MM, Trask B, Schwertz H, Weyrich AS, Zimmerman GA, 2004) and, potentially, other modes of control. Lindemann S, McIntyre TM, Prescott SM, Zimmerman GA, Weyrich AS. Platelet signal-dependent protein synthesis. In: Quinn M, Fitzgerald D, eds. Platelet Function: Assessment, Diagnosis, and Treatment. Totowa, NJ: Humana Press Inc.;2005:149-74. Weyrich AS, Lindemann S, Tolley ND, Kraiss LW, Dixon DA, Mahoney TM, Prescott SP, McIntyre TM, Zimmerman GA. Change in protein phenotype without a nucleus: translational control in platelets. Semin Thromb Hemost. 2004;30:491–498.